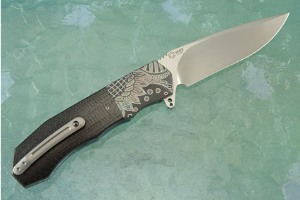 Description: South African knifemaker André Thorburn creates an exceptional folder. The L44 Flipper is a full sized folder. The blade is perfectly centered with silky smooth action. The flipper opening is tremendously easy to use for quick deployment. When combined with the IKBS ball bearing system, the action is exceptional! The Ikoma Korth Bearing System (IKBS) was originally designed to fit balisong knives and uses ball bearings to create exceptional action with no blade play. This special folder is made with ceramic ball bearings. Generally IKBS bearings are made either from tool steel or from stainless steel. Stainless steel can wear away, resulting in uneven action over time. Tool steel bearings can oxidize making the action rough. Ceramic bearings are the best of all worlds -- extremely hard and wear resistant, they are also inert and will not oxidize. 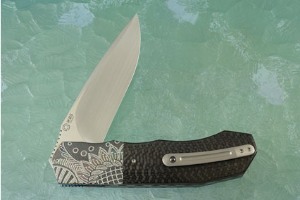 Thorburn is a master of the IKBS pivot and the action on this flipper is as smooth as a knife gets! The blade is formed from N690 stainless steel, created by Bohler in Austria. It takes an incredibly sharp edge and holds on to it. Increased toughness gives it better resistance to edge chipping. 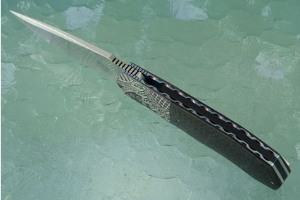 The blade is hollow ground for an easy to maintain edge. By differentially finishing the blade, Andre has emphasized his clean grind lines. 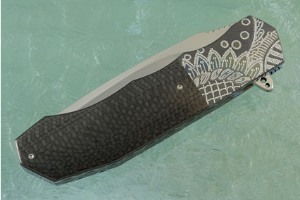 The scales are formed from carbon fiber. Jimping on the thumb ramp provides a comfortable, secure grip. The gently rounded handle feels sturdy and fills out the hand perfectly. 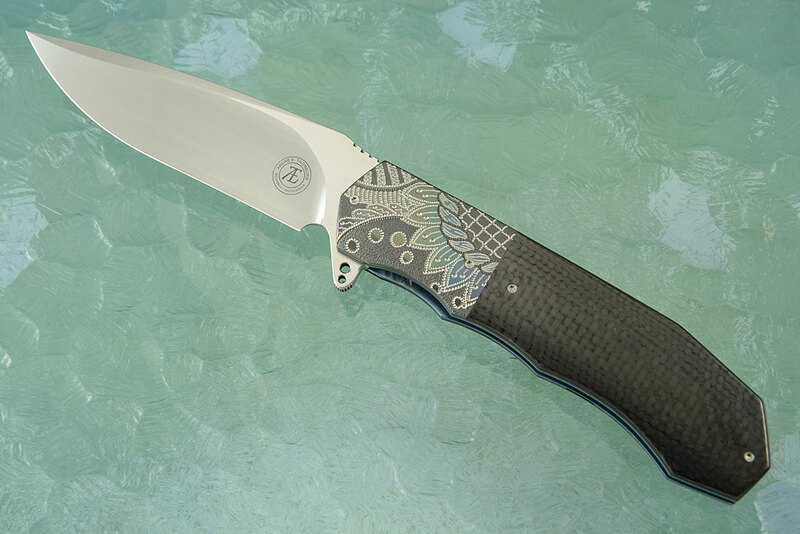 Zirconium bolsters are hand engraved, textured, and anodized by Marietjie Thorburn, ensuring a positive grip. Zirconium is a transitional metal that is primarily mined in South Africa and Australia. It is highly resistant to corrosion and scuffing. Fileworked titanium liners are anodized blue on the flats and purple on the bevels and surround a G10 backbar. The 3D machined titanium pocketclip with ceramic retention ball is mounted for right-handed, tip-up carry. 0.125 0.0458984375 125 45.8984375 Trailer Started.